Serge Flash (1905-1956), born Serge Fomitcheff, was a Russian-American juggler who performed with many props. After the death of Rastelli, it was said he was the only man in the world who juggled nine balls. But his specialty was stick and ball. In addition to technical proficiency, his flair and showmanship brought down the house. In a popular segment, he would catch balls on his mouth stick thrown by patrons in the balcony. He would perform with stick and ball while on unicycle and also on ice, both with the Ice Capades (1941-42) and at the Iridium Room at the St. Regis Hotel in New York City, where an ice skating rink would roll out from under the bar. This poster design is one that I struggled with for months. Part of the problem was I was trying to be too clever. And while I do want a degree cleverness to work its way into this series, it can be overdone. Above all I want these designs to be classy. Balancing the two is a challenge. In the end I went with a classic look. 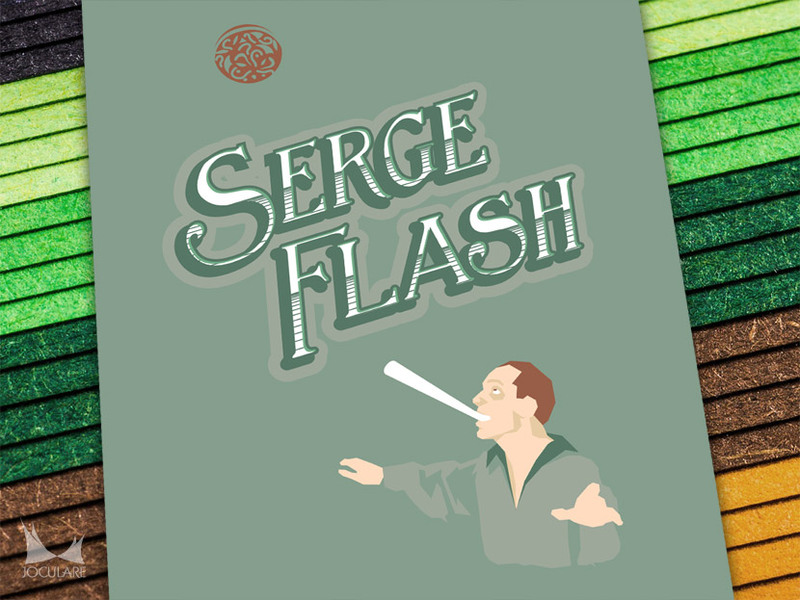 Serge Flash’s expertise was with stick and ball. Juggling and its related performance activities are all about motion. How do you capture motion in a single static image? This is also a problem when photographing jugglers. Their creative juggling of three balls looks great, but when you take a photo, you’re usually left with one ball in the air—not very impressive or interesting. The challenge is to create a sense of motion. So I have Serge Flash in the bottom right, looking up in anticipation of catching the ball on his mouth stick. His arms are out to help steady and balance the catch. The in the upper left a ball descends. The ball is offset to the left. That’s because Flash would attempt to catch balls thrown from the audience—and that is the moment captured here. The design of the ball is crucial to this poster. The pattern was taken from one of his actual performance balls. But the uniting element is the text. The text and the ball both have a retro look that gel the two items, while the text and Serge both implement large blocks of light green which unite those two items. The most difficult part to design in most of these posters is the person. There needs to be a style that makes him or her both interesting and fit into the feel of the poster. I’d like to say I had a master plan for this one, but it just kind of fell together. He feels retro and modern at the same time and I’m very pleased with how he turned out. Jason, thanks for the super-fast response. The juggler that I have footage of does mouthstick, but also top hats, clubs, and other combination tricks which I had not heard of Serge Flash doing. I had found Scott Cain’s article and wondered whether it might be Boy Foy, but like you, I have no information on him doing mouthstick. You’ve been a great help. I’m about to post the video on The Juggling Edge forum if you’re interested. Glad to help… I checked out the thread on The Juggling Edge and see that Boy Foy it is. Great video!